Let us view it as another movie. 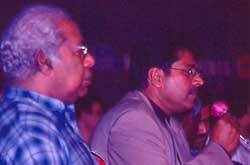 Thilakan is the underdog, superstars are the villains and innocent says that azhikode cannot have a role. However, the issue cannot be taken lightheartedly as the matter involves organised attempt to deny work to an artist. There is a tinge of fascism in it. It smacks of feudalistic attitudes. It also violates the Constitutional right to pursue a profession of one’s choice. Individuals will have their likes and dislikes about other individuals. We can do little if a director or producer decides not to hire an artist for personal reasons. But, organised denial of work falls into an all together different dimension. That is why criticism arose from people like Sukumar Azkhikode. No civilized democratic society could tolerate trade unions trying to infringe rights of workers, in the name of unionism. The movie slumdog millionaire has attracted a huge controversy even as its sound director A. R. Rahman won the Golden Globe Award for “Best Original Soundtrack” and both Rahman and sound director Rasool Pookutty are waiting for the results of their Oscar nominations. The IIPM has used stinging criticism of the movie for its advertisement campaign in national newspapers. Malayalam movie director Priyadarshan has said that the Bollywood had produced better movies of estranged children. However, many Westerners are in all praise for the movie. This, the critics say, is because they look down upon India. However, it seems that Indians are over-reacting about the portrayal of poverty. Satyajit Ray and other Indian directors have portrayed poverty. Squalor is a reality in many streets of India not to speak of slums. If somebody realistically portrays the life of poor blacks in the United States, should the Americans be protesting? The overall score of the film, however, is just above average. It is a fast-paced film with quick cuts for the Western audience. The pace is so fast that you may even find it difficult to follow the storyline. However, it was a brilliant idea to tell the story in a flashback against the background of the Who Wants To Be A Millionaire contest despite hiccups from the non-linear narrative. By and large, it is rather a docu-drama than a fiction film. However, a few sequences are unrealistic and would defy logic. For example, it is so unlikely that the host of the television show would turnover Jamal to police and the police would begin by torturing a person who had become famous. The host would not fail to foresee the damage that could arise if someone alleges that it was done to save the prize money. It would also have been more realistic if the protagonist had rushed for Amitabh Bachan’s autograph after having a quick wash after his jump into the toilet pit. Of course, it can be argued that he managed to cut through the crowd because he smelled so badly. The hero is a winner against all odds. That makes India a place of opportunity and emerging prosperity for him while the film itself show how hollow the perception is. The lot of other slumdogs have hardly improved through high rise buildings have taken the place of their old slum. It reminds one of BJP’s Shining India Campaign. Symbolically, the film rebuts Shining India. Coming to sound recording, it hardly stands out. Yes, that is its quality– non-intrusiveness. Incidentally, Rasool belongs to Kerala though he is based in Mumbai. And A. R. Rahman has done better soundtracks for Bollywood films. Correction: The spelling used officially for Pookutty’s first name is Resul. The State Government’s decisions to give Rs. 1 lakh to the Priyanandanan who directed the film Pulijanmam which won the National Award (2006) for the best feature film sets a bad precedent. Similar cash ‘prizes’ have not been announced for other Malayalees who won national awards. So, it may be assumed that the selective grant to the director is on account of his missing the State Award. In that case, is it right for the Government to compensate an artist because the jury for the State Awards had a different view from that of the National Jury headed by Buddhadeb Dasgupta? Why was the producer left out when the prize money for State and National awards for the best feature film is shared by the two? Cash for Priyanandanan is only part of a larger malady of the Government dispensing discretionary grants to people without clear and transparent criteria. Perhaps the CPI (M) began that with its assistance to the victims of agitations launched by it when in the Opposition in the past. Oommen Chandy as the Chief Minister of UDF Government turned it into a large scale exercise during his mass contact programmes in the 2005-06 period. The criteria often were whether a poor-looking person could reach out to the Chief Minister with an application. Now, solatia are being announced for a wide variety of reasons. Political partiality is often evident in some such decisions. Sometimes, assistance is sanctioned to smother public ire against Government failures to prevent violence or calamities. Now, it is even being offered to set right a possible misjudgment or partiality by State Film Awards jury!? What will the Government do if a film that did not get a State Award went to win a prize, say, at Cannes?